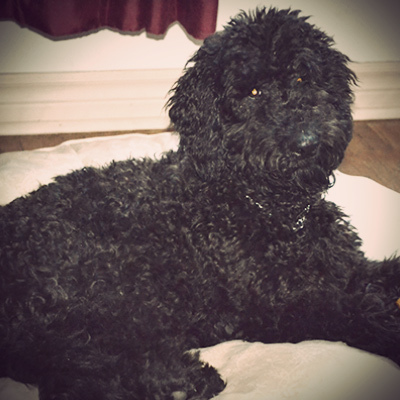 Koda is the son of our girl Daisy and Melorich’s Kodiak from Canadian Doodle Puppies. He looks sooooo much like his mommy with his beautiful cream fleece coat and his liver nose. He is a bit bigger than his mother at 22 inches. He is very much like his daddy. Koda is goofy and playful yet happy to sleep at your feet all day as long as he can be with you. He is sweet and affectionate and obeys commands well. We are thrilled with this boy and look forward to seeing what he will bring to our program. He is a proven stud with some beautiful puppies from his breeding with Pippa. Koda is available for stud service to approved programs. 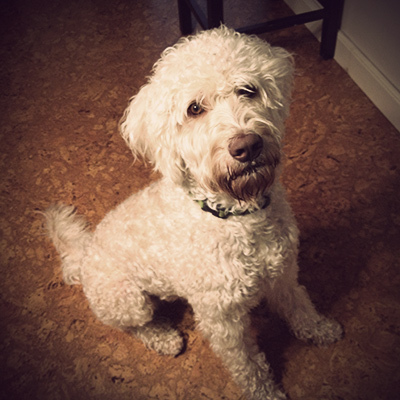 Yogi came to us from Louise at Halton Hills Labradoodles. Thank you so much Louise for letting us add this sweet boy to our breeding program. Yogi is a certified Canine Good Neighbor. 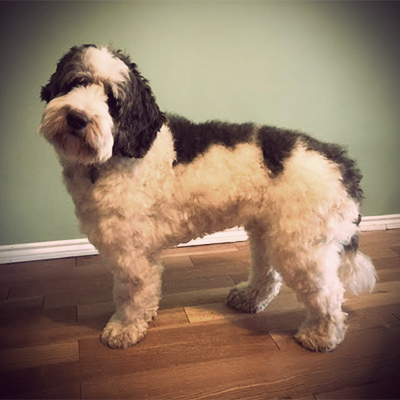 This testing program is sponsored by the CKC to encourage pet owners to make sure their pets are trained enough to be well mannered members of society. He is so goofy and affectionate and he has been doing some wonderful therapy work. He has been at nursing homes as well as doing home visits to individuals and he is a welcome guest at his church. He knows intuitively that he needs to be gentle with certain people. He is a chocolate and white parti color with a wavy to curly fleece coat and he has matured to a nice solid 40 lbs. We are looking forward to seeing the puppies he will produce for us. Meet Teddy, he is our resident goofball! He’s so silly, and loves to play. He loves everyone; human or animal. He is very proud when he goes for his walks and loves to play with friends at the dog park. He loves the water just as much as he loves to play ball. The only other thing he loves more than playing is cuddling with his people, on the bed, or sofa, or chair, or lap! Anywhere he can squeeze in is just fine, as long as it with us. He is one smart guy and loves to learn new tricks. He has a beautiful black curly fleece coat and he carries for chocolate and cream as well. He is a proven stud and has produced a beautiful rainbow litter of puppies with both wavy and curly coats with our lovely Daisy. Teddy is available for stud services to approved breeding programs. Meet Gemstone’s Marquis Diamond. 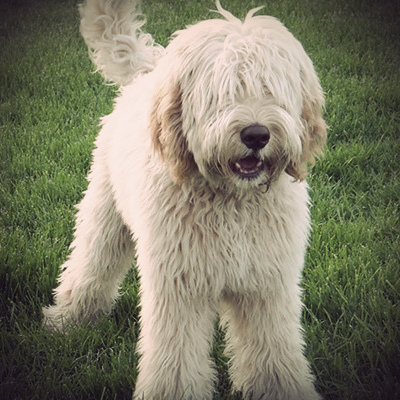 He comes to us from Barb at Gemstone’s Labradoodles. Marquis is a full standard size boy at 24 inches tall. He has a nice square build and wide head. His coat is a very soft silky fleece that is quite easy to maintain. He is a super sweet guy with a very gentle and calm personality. He has great eye contact and a sweet soulful look when you look into his eyes. He comes from a line with proven therapy temperament. We are thrilled to have him in our program. Thank you Barb for this handsome hunk. He lives nearby in a guardian home. Marty has produced some beautiful pups for us with our lovely Casey. We can’t wait to see more pups from this sweet boy. Marty is available for stud services to approved breeding programs. Winston is a standard size F1 labradoodle. His mother was a lovely chocolate lab and his father was a very handsome, brindle parti standard poodle. Winston was one of 10 puppies in his litter. He had a very nice, calmness to him right from the beginning. 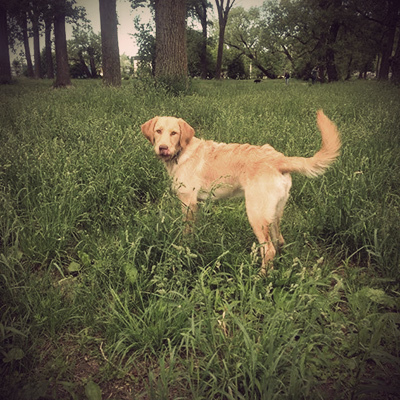 He still loves to run and play and swim but he is also very cuddly and affectionate. Winston is a beautiful caramel color and carries for several different color patterns. Since he is an F1 he does shed. Winston will bring in some diversity to our program along with his wonderful traits. He lives in a guardian home. We are excited to see some puppies from him.